This is the latest accepted revision, reviewed on 22 October 2018. Urge is a citrus flavored soft drink produced by Coca-Cola Norway that was first introduced in the country in 1996, and later on was released in Denmark and Sweden. It is the predecessor of the American soft drink Surge, which was introduced in the USA in 1997. 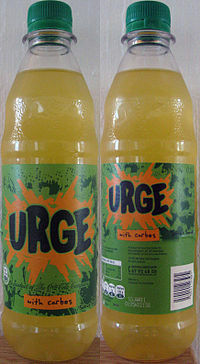 Urge was discontinued in Denmark and Sweden in 2001. In Norway, Urge sales increased greatly over the years reaching a market share near 10% despite receiving no marketing since its initial launch. Urge was available in Norway in 0.5 L and 1.5 L bottles, and later also in 0.33 L cans, but in Q1 of 1999 the 1.5 L bottles were taken off the market due to unsatisfactory sales. The cans also vanished from the market a few years later, leaving only the 0.5 L bottles. A massive campaign by the consumers on the internet community Facebook led to the relaunch of the 1.5 L bottle size on 1 September 2008. It has a sugar content of 68 grams per 0.5 L bottle. In 2017, the 0.33 L cans also returned to store shelves. In 2009, the Facebook group that led to the relaunch of the 1.5 L Bottles helped launched a new Urge branded energy drink called Urge Intense Triple Rush. Much like with many other energy drinks like Burn and Monster Energy, Urge Intense Triple Rush came in 0.5L cans and has a high caffeine content of 32 mg per 100 ml. In April 2010, A raspberry flavored version titled "Red Sting" launched and was sold until the first quarter of 2012. In May 2012 an orange flavored version titled "Inferno" launched and replaced Red Sting. This flavor was later renamed Orange and has since been discontinued. In 2013 a mango flavored version titled "Wild Mango" was launched. After a while this flavor was discontinued alongside the Triple Rush Urge Intense, which led to the discontinuation of the Urge Intense brand. In 2016, Urge Intense was discontinued. In September 2017, a Zero Sugar version was launched known as Urge Uten Sukker. This sugar free variant comes in orange tinted bottles, rather than the clear ones regular Urge uses. In 2018, a Guarana-flavoured variant of Urge Uten Sukker was launched called Urge Chill Guarana. ^ Gleason, Mark (23 December 1996). "Coca-Cola faces uphill scramble with Surge intro". Advertising Age. Retrieved 3 December 2014. ^ Collins, Glenn (16 December 1996). "Coca-Cola, in Direct Attack on Pepsi, to Introduce Challenger to Mountain Dew". The New York Times. Retrieved 3 December 2014. ^ Millman, Nancy (17 December 1996). "Coke Surges into Pepsi's Mountainous Dew Territory". Chicago Tribune. Retrieved 3 December 2014. ^ a b "Urge product page on cocacola.no" (in Norwegian). The Coca-Cola Company. Archived from the original on 2 December 2013. Retrieved 5 January 2009. ^ Foght, Thomas (16 September 2014). "Coca-Cola giver comeback til kult-sodavand fra 90'erne". Metroexpress (in Danish). Retrieved 3 December 2014. ^ "Har de sluttet å produsere Urge Intense? - Mat og drikke". Diskusjon.no. Archived from the original on 1 August 2018. Retrieved 28 November 2017. This page was last edited on 22 October 2018, at 23:14 (UTC).